The following is the 1st message that we received in Egypt this past Oct 2013. You can find our other messages on our website at www.alunajoy.com under the "Articles for Personal and Planetary Transformation" link. It might be a good idea to read them in order as each message builds upon the previous one. We are sharing this message here with you just as we received it, in present time, with very little editing. We do this for a very important reason. We know that the messages that we receive are not just for our groups, but are for others as well. The Star Elders and all the others that joined us, assure me that the message and the corresponding energy will be transmitted to you as you read them. So as you read this, you might want to imagine that you are with us. Also, always view the photos on the website that we share, as photos also hold some energy of the sites. When we walked up the ramp to the temple, we felt an immense amount of love. 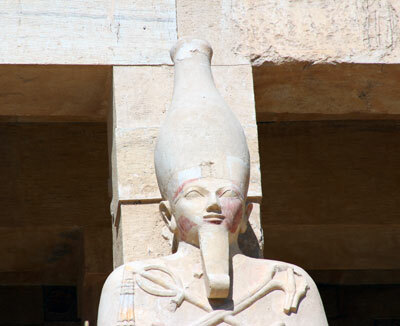 Today there is something tangibly different here at Hatshepsut Temple. Hatshepsut is saying that there is something new, brand new, here today. This has been waiting for a long time to come out into the light. Hatshepsut and the Hathors have been waiting a long time for this time. Egypt and the Holy Lands have been waiting a long time for this time. When I close my eyes, Goddess Hatshepsut (pretending to be a male pharaoh) is showing me a temple chamber that leads into another chamber, into yet a deeper chamber and yet another deeper chamber beyond that. These chambers go way back into the mountain behind this temple. The end chamber has been sealed a long time ago. It has never been contaminated. She is inviting us into this ancient chamber (and those reading this as well). This chamber is also mirrored inside your heart temple. I wish I could draw this for you, because it is a very elaborate geometry of the heart going back deep inside our hearts. 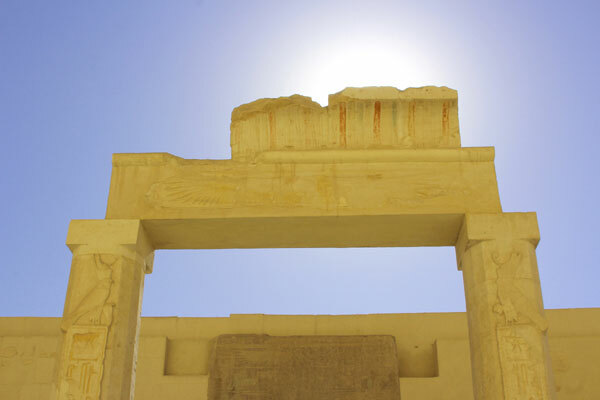 While Hatshepsut was here at this temple site, she anchored something that was gifted to her, and that was gifted to many people before her, which was very, very ancient (pre-Earth). What she anchored is ready for this very important time on Earth. Goddess Hatshepsut is really happy that we are here. She is happy that none of us have to pretend to be something we are not anymore . . . that we can be who we are. Last year she showed us how she could not be herself in her time. She could not let go of her costume of being a man so that she could be empowered as a woman to do what she was called to do. That time of pretending has passed now. That hardship does not affect her spirit anymore. She feels strong in her feminine energy now, so she can let out something that she has been storing away for a long time. She is asking us if we would open the chambers of our hearts to allow what she had stored away, so that it can come into our hearts (Each of us must give Hatshepsut permission to do this). What she is giving us . . . words I could attach to this energy would be "purity" and "integrity." Even though this is a very ancient energy, there is something very, very new and unknown about it. She is saying that this energy has never touched the Earth before. It will start flooding the Earth and will go into all the people who have the open hearts to intuit, the ears to hear, and the eyes to see. It will raise up the Earth's frequency and change everything. OK . . . Archangel Michael is popping in, as well as the Star Elders, to help me decipher / translate what she is saying to me. Even they are having trouble coming up with the appropriate words to describe this new energy. We are in a new cycle of time, and this cycle comes with new Codes of Creation and new Laws of Nature. 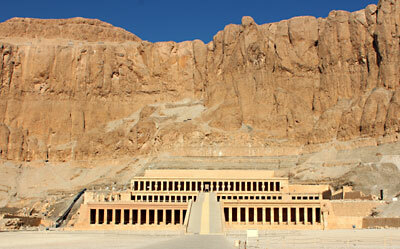 This temple of Hatshepsut holds these codes. These codes go way, way back in time. They go all the way back to the stars, where we all came from in the far distant past. These codes are older than Atlantis. They are older than Lemuria. The energy of these codes is older than ages that we have names for. It is older than the Earth itself. I guess you might call it the equivalent of the cosmic Holy Grail. It looks like this current journey is going to be about touching and absorbing energy that has never been here before. This is the purpose of 2013 through 2016. Goddess Hatshepsut is asking if she can put this new energy in a secret place in your heart. This is the place that you have always known about, a place where there is something inside of you that is so sacred that you have never let it out. You have never shared it, because it is so holy, pure and uncontaminated. You know this place that I am talking about, right? It is the place inside of you that you have never dared share with anyone, because it is just too precious. What she is offering you is something that will trigger this inner holy place into the next level of consciousness, frequency, evolvement, etc…. She is giving our inner holy place the water it needs to grow. Goddess Hatshepsut says that she had to live through a time that was really tough, and she had to pretend to be a person that she didn't want to be. She pretended to be something that she was not; but all the time inside, she knew it was worth it, because she had something stored that would help in the future. Just like all of us intuitively know that this is the lifetime: this is the time that something special is happening on the Earth and with humanity. So (as you read this) she is activating this place inside of you, the place that is totally sacred and that you have yet to ever let out into the Earth. This energy is similar to what she anchored way back in the mountains. There is energy for the Earth's evolution and similar energy for humanity. She says this is why we feel the mountains are alive here. It is true, because this energy is permeating this whole mountainous area, and that is why she wanted to build her temple here. She knew she could use this natural mountain formation to safely store this energy for as long as she needed to and again use it as a natural amplifier. When this energy/wisdom/alchemy is released, it will flow down these huge temple ramps and flood out into the world. There is a serpentine line carved on the top of the wall on both sides of the walkway that goes right down into Horus. Horus is the protector, and he will oversee this distribution of energy. He is also a link to Archangel Michael. I am actually getting a glimpse of this energy. It looks like a golden ball of light, and it looks like there are many universes inside this golden light. Hatshepsut wants to share this energy with us. We can place it inside of our hearts and carry it with us throughout this journey. She is quite clear in saying that this energy activation is going to build during the journey. There are other temples that are also connected to the feminine that we will connect with, and we will be receiving many pieces . . . like pieces to a puzzle. This energy will help us open our hearts, have more compassion, unconditional love, and empathy. It will strip away any of our differences and bring unity; but it will also trigger a new science . . . alchemy . . . of life. We will have more compassion and have less division between us and other human beings: divisions like social status and educational levels, religions, genetics, and all the things that have been separating us. We will find that these boundaries will blur really quickly. They already have in us. Now I understand why they called this pilgrimage "The Alchemy of Rebirth." We are receiving a new science / technology of the heart that is an alchemy that will help us be able to morph into new beings and also trigger this for others throughout the entire world. We hope you understand. The love Goddess Hatshepsut is sending us is so beautiful. She has been lovingly guarding this place along with thousands of other guardians here in the mountain sides. When she sets this love free, giving it to us, she will be free also. So she is thanking us, because we will give her the wings to fly. She will also give us the wings to fly as well. We will have the ability to see through the darkness and transform our bodies. We won't need anything outside of ourselves to manifest. Slowly, step by step, over the last twenty or thirty years we have been preparing for this. It is becoming more and more of a solid, actual physical reality now. It is not just something that we have learned about. It is something that is actually going to take hold in the physical form as we start being Living Masters. Being a Living Master is very different from an Ascended Master. An Ascended Master is one who obtained mastery and ascension, left this physical reality, and is now working from higher realms to help humanity. A Living Master is living from mastery, while being able to maintain mastery in a physical body. This is something we have been trying to do for a long, long time, and it is starting to take hold now. Once the barrier is broken and we are as living masters, this will shake up the world in ways that we can only guess at now. When we start walking and living as Living Masters, it will also bring peace and harmony back to the world. As Jeshua said, "What I have done, you can do also and greater things." This is one of many greater things. Jeshua ascended and went to a higher vibration. We are going to be able to hold this new type of frequency, this type of love, but also be here in a physical body with our feet on the ground. We will be able to help transform the Earth along with us. The Earth is already transforming. Humanity and Earth have a symbiotic relationship. We are all doing this together. I think this is what Goddess Hatshepsut wanted to share with us today. I could feel her while we were still on the Afandina (our Nile sail boat) this morning. So I knew she wasn't going to waste any time when we arrived here. Group member Debbie makes a point: This is about unity consciousness. It is about the balance of the masculine and the feminine. And for her, she was that. She was feminine, but she had to live a masculine life. Aluna comments: I think what she is anchoring here and offering to us is way beyond any place where there was duality. In the past, we chose to separate and be diverse to learn lessons. We had to experience the duality and the polarities to learn. But now we have learned what we needed to learn. Our guides, guardian angels, Masters, etc. . . are starting to unify us, and that is why we may have been feeling so dizzy. Although, since we have been on the Nile, I have noticed that the dizzy, woozy, spinning feeling is subsiding due to the magical energy that comes from the Nile. I think the Nile is really going to help us. It is funny because we have been so impatient about getting to where we know we are supposed to be . . . our whole life. Hatshepsut is really impatient to get this energy downloaded to other people. As other groups come here, she can send out more of this energy. She is so done with this present dimension (laughter), just as we have been feeling this year that we are also done. She is ready to finish the job that she started, like the rest of us, and she wants to fly with us. On an alternative historical note . . . the Star Elders shared with me that this temple was built like the ones in Atlantis. But in Atlantis they used a translucent, mystical stone that does not exist anymore. These stones disappeared during the fall of the Atlantean Age. 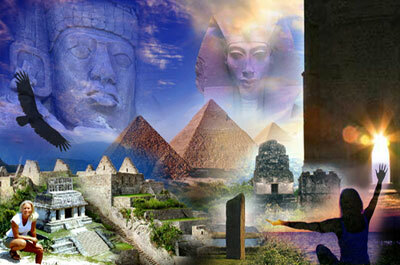 But some of the architecture (like the altar stones that are placed inside this temple) is based on Atlantean alchemy. In the pure holy days of Atlantis, no one person could be in total control of the power. Sadly, this changed at the end due to greed and ego. True alchemy and power were reached only within a group, or a community of initiates, working with balanced energy. Initiates would use different altar stones / holy stones. When they would work in perfect harmony, they could switch on the lights, so to speak. Built after the fall of Atlantis, Hatshepsut Temple and Luxor Temple are the two temples where they tried to maintain this alchemy. The building of these temples was overseen by Ascended Master Serapis Bey and Thoth, the Atlantean who survived the fall of Atlantis . . . and also Akhenaten, who believed in living with authenticity and taught unity and the presence of One God. Aluna Joy Yaxkin, www.AlunaJoy.com Ⓒ 1995-2013 - Unauthorized use and/or duplication of any material on our web site without express and written permission from its author and/or owner is strictly prohibited. Violators will be reported to the DMCA. Please respect our work, that we intend to continue to offer to you freely. If you are feeling appreciation for our work please consider sending us a HEART DONATION, or better yet, send an easy re-occurring donation. This is not required . . . but donations help keep our messages coming to you. Donations also help us pay for a private server needed to send bulk e-mails, additional bandwidth for video, the helpers that put our Free Newsletter into your in-box, as well supporting our other service programs. We want to maintain this free newsletter offering as long as we can. We realize that is becoming quite rare these days to offer this much time and effort freely, but we also trust that Spirit and our like minded community will cover our expenses. Make Donations for FREE! Do you shop on AMAZON? You can send us a LOVE DONATION and not spend a extra dime, every time you shop at Amazon all year long! Donating to our work is as easy as bookmarking our unique Amazon link and using it each time you shop! We have a partnership with AMAZON which donates 2-5% of most any sales made by any shopper entering Amazon through our unique link. No matter where you after entering our unique link, your purchases provide a bit of support for our free Newsletter and our other service programs. Thank you for supporting our work! Use this link to shop! Bookmark and USE this link! HUGE THANK YOU for your support. There are things that happen only once, and then again, never exactly the same way... things that only we experience. There is no way to predict when magic lands where we are. We just have to put ourselves out there and keep our eyes open, and feel blessed when we see receive gifts from spirit. These are experiences that no one else will ever see in the same way again. We joyfully offer Sacred Site Spiritual Pilgrimages since 1995 to the Maya, Inca and the Egyptian Worlds and the Celtic Worlds of England and Scotland. Come join us on a Spiritual Pilgrimage!